First insert the second image by choosing Insert> Pictures> From File. (In PowerPoint 2007, choose Insert tab> Illustrations group> Picture.) Then insert the first image on top of the second. Move the first image slightly, so you can easily select the second image on the bottom. Choose Slide Show> Custom Animation. (In PowerPoint 2007, go to Animations tab> Custom Animation.) Select the first image, and choose Add Effect> Exit> Fade. Set the Start to After Previous. Set the Speed to Medium, or whatever speed gives you the result you like. To specify how long the image will be on the screen before it starts to face, select its item in the Custom Animation task pane, click the down arrow on the right, and choose Timing. Then add a value in the Delay text box, such as 1 second. Select the second image and choose Add Effect> Entrance> Face. Set the Start to With Previous and the Speed to Medium. Finally, place the first image exactly on top of the second image. The result is an animation that shows the first image, then fades it out while the second image fades in. Note that if the two images are exactly the same size, you don’t need to add entrance animation to the second image; you can simply fade out the first image to reveal the second image. Don’t the interacting people looking like they’re having more fun? How do I extract that slide from Powerpoint as a GIF image? I tried saving that slide as a GIF image, as a JPEG image & as a PNG image. But it does not animate. It animates only in Powerpoint. I never create animated GIFs but there are programs that create them — I just don’t know of any — but you can search. They work by inserting the individual images and displaying one after another quickly. You wouldn’t get the dissolve effect you get in PowerPoint. I have created a slide show with seven images , each with animated text. Transition from slide to slide is where I’m stuck . I have gone to slide show / slide transition and looked at all of the choices , and I want the slow dissolve from one image into the next. This option is not available in the slide transition choices … I know about the fade option, and all the others , but I want slow dissolve. I have figured out how to slow dissolve from one image into another , but I can’t figure out how to do this with the slides I have created with animated text . 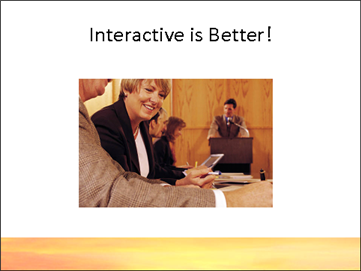 PowerPoint 2010 has much better fade transitions – they actually look good. In earlier versions, the only solution is to put all of the images on one slide and fade them in and out. Or just fade each higher one in. Stagger them as you work, then place them on top of each other. Thanks heaps for this Ellen. I am helping my 14yr old nephew with a history assignment, and this is exactly what he was wanting for his presentation. I promised him I would help him figure it out, but I was struggling! He’ll be stoked! I tried to open gif image with animation effect but the image not to show any animation, it just show only one image not the another one. so now tell me what to do. Hi – thanks for this. For my introductory slide, as the audience is being seated, I would like to have two pictures fade in and out of each other, as if on repeat. Do you know if there is a way to do this? Adela, you first said they were in Slide Show format which is a PowerPoint format (.ppsx probably). You would need PowerPoint to combine them. There are other options, like taking a screenshot of all 4 (if you can display them) and combining them into a PDF file, but that’s more complicated. I’d recommend sending them to a friend who has PowerPoint to combine them. Ellen, I have photos of my home town from the 40’s and earlier. I want to transition them with present day photos from the same viewpoint. The effect I need is for the customer to access each photo and to be able to go forward and backward with a mouse click. Can I accomplish this with photoshop or do I need another program? Turk, it all depends where you want your customers to see this. On your website? On a 3rd-party website? You can post a presentation on PowerPoint Online (try https://office.live.com/start/PowerPoint.aspx) and people can go forward and back easily. 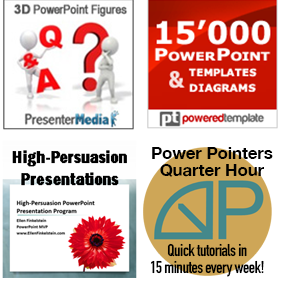 You can also embed a PowerPoint Online presentation on your website. From PowerPoint Online, click the 3 dots at the right and choose Embed to get embed code. This is close to what I wish to do. I have several objects on a slide that hyperlink to other slides. When I return to the original slide, I want to come back to the original slide and have the object that I clicked on “Disappear” so that it isn’t an option anymore. I got the hyperlinks down, but I can’t make the original object disappear. Any ideas? I think you’d have to use a trigger. Then, you would click on the object (or another object) and it would disappear. I am a Mac user with OS 10.11.6 and have Office 2008. 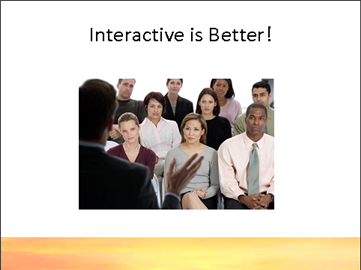 The PowerPoint in 2008 does not have a fade/dissolve. I would like to have that feature in my presentations. Is it possible? Thanks.